After almost 20 years, the UK's first and longest running snowboarding magazine - Snowboard UK - has gone bust. Or to put it more accurately, the company that published the mag (and a number of other non-snow titles), Freestyle Publications Ltd, has gone into administration. 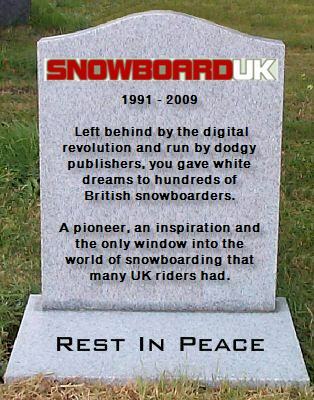 It's sad news for the UK snowboarding industry. SUK had a special place in my heart; it was those pictures of the fluorescently dressed snowboarders pulling half pipe hand plants in the early '90s that fuelled my fire for snowboarding, and for several years, devouring the mag each month was the closest I got to the real thing. As I gorged on pictures of far away snow capped mountains, in my rural English village, little did I know where my love of snowboarding would lead, and that I would even end up writing for the same magazine a decade later. The other day I flicked through some dusty back issues of SUK, nearly ten years old. It occurred to me how much weight the mag had lost in recent times. Those pages and pages of glossy ads had dried up, and with them, the revenue. SUK had gone bulimic, and without those fatty ads, the muscle of the mag - the articles and pictures - were wasting away. Having written for SUK Magazine myself for the last three seasons, and gotten to know the editor Mark McGettigan - it's very sad to think that SUK won't be appearing on our shelves this autumn. There is of course a chance that the mag will be bought by another publishing company, and that we could see SUK resurrected, but in this climate where printed media is already losing a lot of ground to digital publications - I have to say I think it's unlikely. Indeed, rival mag Whitelines seemed to understand that the future (or at least part of it) was on the web, and embraced it, creating a rather beautiful and stylish site, and launching the 'Friday Fix' a clever use of email marketing, along with its printed publication. SUK's website on the other hand was quite frankly, rubbish. Almost never updated and ugly, SUK got left behind in the digital revolution, and now it's too late. I really liked working with editor Mark and enjoyed the mag itself, but I don't have a lot of love for the publishers (Freestyle Publications Ltd) - who had a long history of withholding payment, or not paying their writers and photographers at all (I am still owed money and unlikely to ever see it now). This has been documented by many of their contributors over the years, and is inexcusable, dishonest and completely unprofessional. However, I do genuinely hope that SUK does get resurrected and that Mark McGettigan gets reinstated as the editor in chief.